File under: A no stress, highly entertaining read, in which a boy runs away from civilization and fashions a cabin/home out of a HUGE hollowed out tree (in the Catskills). Also, for those who don't dig the book recommendations (sorry! )- I've just been gearing up for another filmed edition of "Man with the Ugly Hat"- my tiny housing/small living side-jaunt episodes about literature. 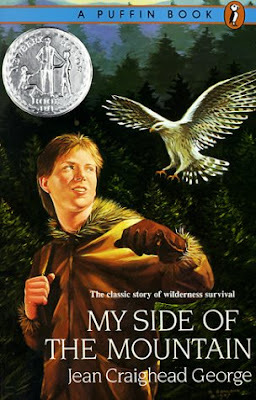 This little "easy-reader" was penned by Jean Craighead George- who was a Newberry Medal recipient (for "Julie Of The Wolves"), and "My Side Of The Mountain" was a runner-up to the very same award (a different year). The book was originally written in 1959, and has been a HUGE worldwide seller, so most of you might already know of it. It somewhat reminds me of the Gary Paulson HUGE-selling young-adult novel "Hatchet"- another one I never read until now- in my 30s. Both are quick, yet pretty phenomenal reads if you're looking for some outdoor adventure, and a "Get away from it all" motif. Anyway, I'm not going to give too many book write-ups afterall, but I HAVE been compiling my list of top ten or fifteen all-time tiny house/alternative shelter buildings, and if any of your readers have any input/suggestions- feel free to add them in the comments section, or on our "Tiny Yellow House" small housing club/group.